"Magnificent," intoned the deep voice on the other end of the phone. Eduardo Quevedo, retired college professor, onetime Jesuit, and the son and namesake of the most prominent California Latino of the 1930s, had finished my book, The Search for a Civic Voice: California Latino Politics, with a foreword by Antonio Villaraigosa. Quevedo wanted me to know that he approved, that he had enjoyed the book, and that it had brought back a flood of memories. He reminded me that he was old enough to know most of the people about whom I had written. Such phone calls—along with e-mails, letters, and conversations at book signings—proved a rewarding, though largely unexpected, part of being an author. I mean, I had written articles and published in other people's anthologies. I had even won an award from the Historical Society of Southern California. But this was different. Very different. Young people asked for career advice and insights into the functioning of government, intrigued by political celebrities like Mayor Villaraigosa and by behind-the-scenes policy and political machinations at the state Capitol in Sacramento. Now, several months into promoting the book, it seems like the ideal time for a little reflection. It's a process that started to gel over the weekend, as I walked briskly on snowy sidewalks after speaking at a national Latino studies conference at the University of Kansas. 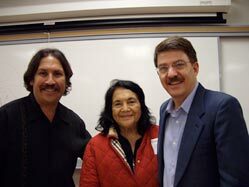 Daniel Dodge, Dolores Huerta and Kenneth Burt at the Southwest Labor Studies Association Conference. As this trip evidenced, I have done what's expected in promoting an academic book, mainly speaking on campuses. I have talked to classes and at conferences. This includes a Chicano studies conference at the University of California, Merced, and the Southwest Labor Studies Association conference (with Dolores Huerta) at San Francisco City College. But what is unique (I am told) is the extent of community interest. Appearing twice on National Public Radio (NPR) in Southern California (including the Larry Mantle Show) was a fabulous experience. Here reporter Kitty Felde should get points from her colleagues for being ahead of the journalistic pack. She did a nearly four-minute segment with me on the role of Latinos in presidential campaigns, from Roosevelt to the present-months before the Iowa caucuses! 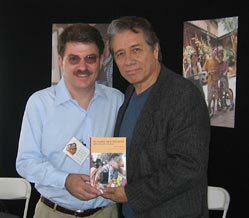 Kenneth Burt with Edward James Olmos at Latino Book Festival. There have been invitations from numerous Latino organizations, including the Latino Legislative Caucus, the Latino Book Festival, the Labor Council for Latin American Advancement, and the American GI Forum. And coverage of the book in the state's largest Spanish language newspaper, La Opinión, and in the Catholic press. "On behalf of the Modesto GI Frum, I would like to thank you for your recent article ['This month, honor political, military Latino trailblazers'] published [on September 16th] in the Modesto Bee," e-mailed Christopher Ortega in September. "Your work is necessary in educating the public to the significance of the Latino culture and their legacy in the United States." The missive touched me, in part because of my father-in-law's role in Mexican American veterans' organization in the 1950s and 1960s, and because these former soldiers felt I was helping to create better societal understanding at a time when filmmaker Ken Burns had to be forced to include Latinos in his Public Broadcasting Service (PBS) documentary on World War II. Written for the Washington, D.C.-based Hispanic Link Weekly Report, my column on Hispanic Heritage Month was distributed coast-to-coast (in English and Spanish) by the Scripps Howard News Service. Suzanne Marquez, a longtime friend of mine, and an aide to Los Angeles County Supervisor Gloria Molina, told me that her father had served in WWII with Pvt. Felix Longoria, whom I mentioned in the column. Longoria's death had contributed to the Forum's founding because a Texas cemetery owner had refused to bury Longoria's body in the town's "white" cemetery. In response, Dr. Hector Garcia, a WWII medic, appealed for help to Senator Lyndon B. Johnson, who arranged with President Harry Truman to have the fallen soldier buried in at the Arlington National Cemetery. Dr. Garcia had successfully used patriotism to trump racism. The incident also demonstrated the importance of civic engagement to a generation of Mexican American veterans. It was likewise the beginning of a political alliance between Latinos and Johnson, and later with John F. Kennedy. Recognizing Dr. Garcia's the pivotal role in Latino empowerment, I had traveled to Texas to interview him on my way home from grad school at Harvard. On that trip, I rode a Greyhound bus to Arizona where I met with Carlos McCormick, and to New Mexico, where I interviewed Vicente Ximenes. These Forum leaders made their marks as heads of Viva Kennedy and Viva Johnson, respectively, and as presidential advisors. Viva Kennedy architect Carlos McCormick was a native of Santa Barbara. He was introduced to César Chávez in the late fifties by his mother, who had become active the Santa Barbara chapter of the Community Service Organization (CSO), the Saul Alinsky-affiliated group for which Chávez was then the executive director. One of the best parts of the book events was the participation of former activists. For example, Hope Mendoza Schechter attended the book signing at the Glendale Public Library. The first Mexican American garment-worker organizer in Los Angeles, Mendoza Schechter helped organize the CSO in Los Angeles 1947, and then helped oversee the first large-scale voter registration drive there in 1948. She also got Congress to amend the law in the early 1950s, making it easier for Latinos to become citizens. At a reception at Cal State Los Angeles, several interviewees honored me with their presence. The senior activist, at 92, was Jaime Gonzales Monroy. As a steelworker, Monroy was head of the Los Angeles CIO Council's Minority Committee at the time of the Zoot Suit Riot in 1943. Then, in 1947, as a YMCA staffer, he served as CSO's founding vice president. He worked closely with CSO founding president Edward Roybal (later the state's first Latino congressman). Henry Lacayo also joined in the festivities at Cal State Los Angeles. Now president of the California Congress of Seniors, Lacayo was elected to lead the largest local union in California in the 1950s; he went on to serve as national political director for the United Auto Workers, and was the sole Latino on President Jimmy Carter's transition team in 1976. It was an honor to introduce these early labor activists to the Chicano professors with roots in the 1960s social movements. Jaime Regalado from the Pat Brown Institute and Frank Quevedo from Southern California Edison (and the chair of Mexican American Legal Defense and Education Fund), served as wonderful hosts for the event, along with the university librarian. At UC Berkeley there was a reunion of a different sort. Professor Emeritus Carlos Muñoz, who encouraged me to start my research on the Mexican American Political Association in the late 1970s, was there to help celebrate the book's debut. 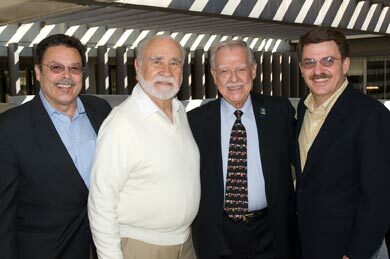 Muñoz had served as the first president of the national Chicano studies association. The event also attracted a wide range of academics, labor leaders, and community activists. State Assemblyman Jose Solario, Kenneth Burt, and MacArthur "Genius" Fellow Ruebén MartÌnez at the recent book signing at Martínez Books and Art in Santa Ana. Rueben Martinez, proprietor of Martinez Books and Art Gallery, and a MacArthur "Genius" Fellow, hosted the Santa Ana book signing with Assemblyman Jose Solario. In a message to friends, Martinez wrote that "my longtime Sacramento politico friend, Kenneth Burt . . . has written the most comprehensive and exhaustively researched book on Latino politics in California. There simply isn't another book like this one." In Ventura County, the Central Labor Council distributed copies of the book at its annual banquet. The Ventura Star put the book on its front cover, replete with a dozen color photos, in an insightful piece that linked history and current events. While reviews in academic journals typically take a year or more to find their way into print, The Search for a Civic Voice received prompt and very positive coverage in the newsletters circulated to academics and practitioners by UC Berkeley's Institute for Governmental Studies and Sacramento State University's California Studies Association. So, too, have voices weighed in on the Web. 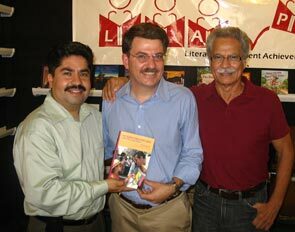 "Kenneth C. Burt [is the] author of an excellent new book[,] The Search For A Civic Voice: California Latino Politics. Burt tells the story of Latino politics from before World War II to the present day. His book explains the long and difficult Latino rise to present day influence and shows the complexities and subtleties of the Latino community in a way missed by the mainstream news media," according to former Los Angeles Times columnist (and Jesse Unruh biographer) Bill Boyarsky, on LA Observed. Rosa Martha Villarreal, in her review in Tertulia Magazine, said, "The Search for a Civic Voice is a refreshing throwback to when histories were not only meant to be informative but dramatic and entertaining." The Latina novelist concluded by stating that "The Search for a Civic Voice should become a classic on 20th Century Hispanic politics in California." Recently, I have started being asked: "What will you write about next?"